I just noticed a potentially interesting paper by Martin Sahlén on the arXiv. I haven’t actually read it yet, so don’t know if I agree with it, but thought I’d point it out here for those interested in cosmology and things Bayesian. Modern scientific cosmology pushes the boundaries of knowledge and the knowable. This is prompting questions on the nature of scientific knowledge. A central issue is what defines a ‘good’ model. When addressing global properties of the Universe or its initial state this becomes a particularly pressing issue. How to assess the probability of the Universe as a whole is empirically ambiguous, since we can examine only part of a single realisation of the system under investigation: at some point, data will run out. We review the basics of applying Bayesian statistical explanation to the Universe as a whole. 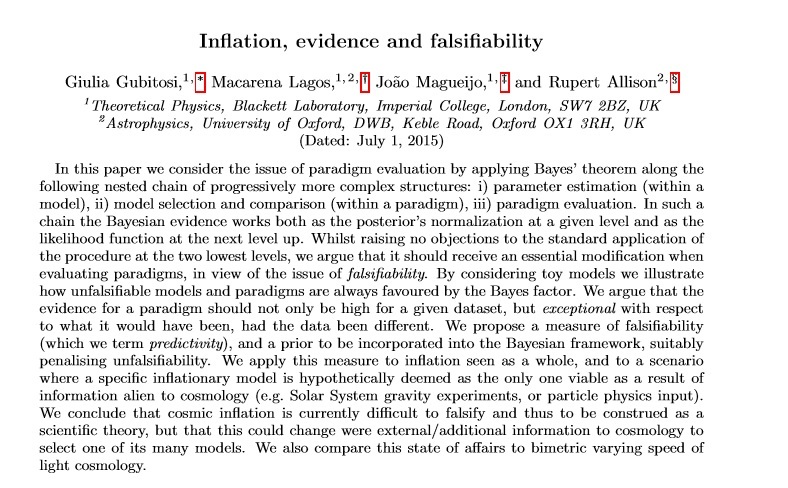 We argue that a conventional Bayesian approach to model inference generally fails in such circumstances, and cannot resolve, e.g., the so-called ‘measure problem’ in inflationary cosmology. Implicit and non-empirical valuations inevitably enter model assessment in these cases. This undermines the possibility to perform Bayesian model comparison. One must therefore either stay silent, or pursue a more general form of systematic and rational model assessment. We outline a generalised axiological Bayesian model inference framework, based on mathematical lattices. This extends inference based on empirical data (evidence) to additionally consider the properties of model structure (elegance) and model possibility space (beneficence). We propose this as a natural and theoretically well-motivated framework for introducing an explicit, rational approach to theoretical model prejudice and inference beyond data. You can download a PDF of the paper here. As usual, comments are welcome below. I’ll add my thoughts later, after I’ve had the chance to read the article! M-dwarf stars are more abundant than G-dwarf stars, so our position as observers on a planet orbiting a G-dwarf raises questions about the suitability of other stellar types for supporting life. If we consider ourselves as typical, in the anthropic sense that our environment is probably a typical one for conscious observers, then we are led to the conclusion that planets orbiting in the habitable zone of G-dwarf stars should be the best place for conscious life to develop. But such a conclusion neglects the possibility that K-dwarfs or M-dwarfs could provide more numerous sites for life to develop, both now and in the future. In this paper we analyze this problem through Bayesian inference to demonstrate that our occurrence around a G-dwarf might be a slight statistical anomaly, but only the sort of chance event that we expect to occur regularly. Even if M-dwarfs provide more numerous habitable planets today and in the future, we still expect mid G- to early K-dwarfs stars to be the most likely place for observers like ourselves. This suggests that observers with similar cognitive capabilities as us are most likely to be found at the present time and place, rather than in the future or around much smaller stars. informal description of Bayesian inference provides a way to assess the probability of a hypothesis in light of new evidence. Anyway, I was so unconvinced by this description’ that I stopped reading at that point and went and did something else. Since I didn’t finish the paper I won’t comment on the conclusions, although I am more than usually sceptical. You might disagree of course, so read the paper yourself and form your own opinion! For me, it goes in the file marked Bad Statistics! Can We Actually Even Tell if Humans Are Affecting the Climate? What if we did nothing at all? 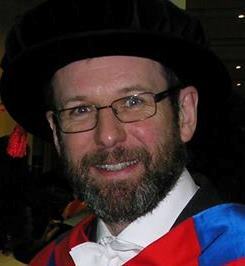 Reblog of a post about the doctrine of falsifiablity and its relevance to Climate Change….following on from Monday’s post. We know, with great certainty, that the overall average temperature of the Earth has warmed by several degreees in the last 400 years, since the end of the Little Ice Age. Before that was a period called the Medieval Warm Period; before that was another cold period, and back at the time of the Romans there was a long period that was significantly warmer — Southern Britain was a wine-growing region. What we’re a lot less certain about is why?